NEW YORK - Circa July, 2016 - A unique aerial view of buildings on York Avenue in Manhattan as seen from the Roosevelt Island Tramway. 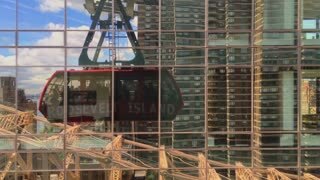 A unique perspective of the reflection of a Roosevelt Tramway car as it passes buildings in Manhattan on it's way to Roosevelt Island. 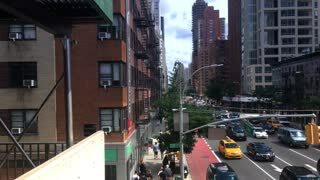 NEW YORK - Circa July, 2016 - A unique aerial side view of traffic on the Ed Koch Queensboro Bridge as seen from the Roosevelt Tramway. 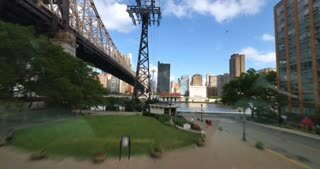 NEW YORK - Circa July, 2016 - A unique aerial view of the East River as seen from the Roosevelt Island Tramway. Part 2 of 2. NEW YORK - Circa July, 2016 - A view up 2nd Avenue in Manhattan as seen from the Roosevelt Tramway. NEW YORK - Circa July, 2016 - A passenger's forward perspective riding the Roosevelt Tramway to Manhattan. NEW YORK - Circa July, 2016 - A unique aerial view of the Manhattan Skyline as seen from the Roosevelt Island Tramway. NEW YORK - Circa August, 2016 - An evening aerial view of Midtown Manhattan as seen from the Roosevelt Island Tram. 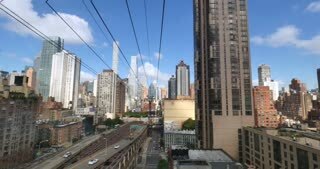 NEW YORK - Circa August, 2016 - A daytime aerial view of Midtown Manhattan as seen from the Roosevelt Island Tram.